IMEL students are very active outside of the laboratory when it comes to attending conferences, meetings, and participating in university events. 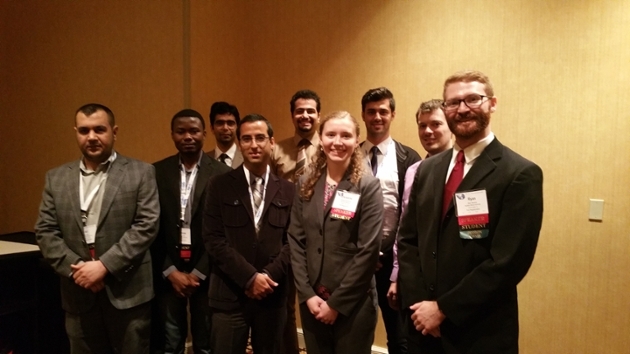 IMEL students consistently attend and present research in American Society of Nondestructive Testing (ASNT) and Society of Experimental Mechanics (SEM) conferences and meetings, both internationally and regionally. IMEL research presented in these conferences covers a wide array of topics and methods developed in the laboratory. Further, research conducted in the IMEL is presented in SIU research town meetings and Saluki IDEA competitions. In addition, IMEL students are very active in volunteering for community events hosted at SIU where demonstrations are given to increase interest in university research and nondestructive evaluation (NDE) in the public. Each year, IMEL students volunteer in SIU Engineering Day, a public event hosted by the college of engineering for high school students to increase interest in engineering and research. Each year at the event, IMEL provides demonstrations of NDE systems such as ultrasonic testing and infrared thermography. This is an annual event which provides unique opportunity for faculty, staff and students to network with each other to discuss their work and see what scholarly and creative activities are being conducted at SIU. IMEL members actively participate in this event. IMEL members were awarded 1st place for poster competition held during the 2011 and 2013 Research Town Meeting and Fair. The mission of this event is to boost SIU Carbondale student and community involvement with innovative thinking and business development to address local and global challenges. The first Saluki Idea Competition was launched on August 27, 2012 and finished at the Tech Expo on October 19, 2012. Individual students and student-led teams competed for the first round of online crowd voting. In the second round, the top five vote getters gave 3-minute elevator pitch presentations to a panel of distinguished judges at the Technology and Innovation Expo on October 19, 2012. Scoring by the judges determined the winners. Read more..
Anish Poudel and Dr. Chu participated in this event. They presented their idea on "The development of an Intelligent Non-Destructive Evaluation System for Aircraft Composite Inspections" and received honorable mention. Members of IMEL, led by Dr. Chu, have started and lead a Non-Destructive Evaluation Club. The students are able to get involved in various ASNT conferences and events.